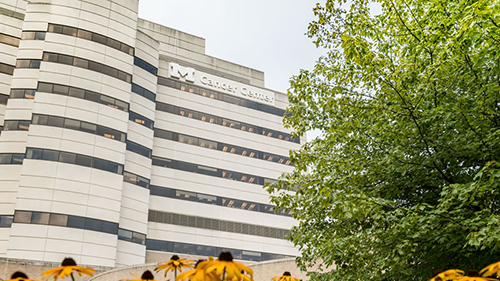 The University of Michigan Rogel Cancer Center in Ann Arbor and Connecticut-based Aetna Friday announced a collaboration to create a value-based oncology medical home that is designed to improve the care experience for cancer patients. The arrangement began on Oct. 1. The model is part of a decision to transition from fee-for-service reimbursement to value-based payment. In value-based models, doctors and hospitals are paid for helping to keep people with chronic conditions healthy and improving health in evidence-based, cost-effective ways. Value-based arrangements are emerging as a solution to address rising health-care costs, clinical inefficiency, and duplication of services. As part of the oncology medical home, the Rogel Cancer Center team will be responsible for providing or arranging all of a patient’s health-care needs with other qualified professionals, including preventive services, acute care, chronic care, and end-of-life care. The team will also focus on designing treatment regimens that take into consideration each unique disease presentation, patient-specific factors, and patient choice by the using the center’s Clinical Pathways, which were designed by teams of surgeons, medical oncologists, hematologists, and radiation oncologists. Care will be facilitated to enable Aetna members to get the appropriate treatment when and where it is needed and wanted. Another focus of care will be quality and safety and include evidence-based medicine, clinical decision support tools, and accountability for continuous quality improvement. Aetna is working with health-care organizations nationwide to develop products and services that support value-driven, patient-centered care. Nationally, about 7.1 million Aetna members receive care from doctors committed to the value-based approach, representing more than 50 percent of the company’s medical spend. Aetna hopes to increase that number to 75 percent by 2020.